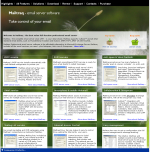 Explore the highlights of Mailtraq's key features. Taking control of your email is a key step for small businesses and organizations but it can be hard to go it alone. That is why Support is an integral part of your Mailtraq purchase. When you are in charge of your own email you need someone to turn to, and Mailtraq Support is there to help. It's simple - no hoops to jump through. Support is free with your license purchase.